The Bay Area Renaissance Festival in Tampa wrapped up at the end of March. Check out what we found. This is Kodiak, a Great Pyrenees. Kodiak is sporting a full color, beautifully-handmade set of scale armor. Modern Armour is Michael Jenkins' business. He lives in Spring Hill, Florida, making chain mail and scale mail for humans and dogs. He has an Etsy shop where you can order order in every size. Prices vary depending on what you want, and he can customize it too. The armor Kodiak is wearing is worth thousands of dollars! 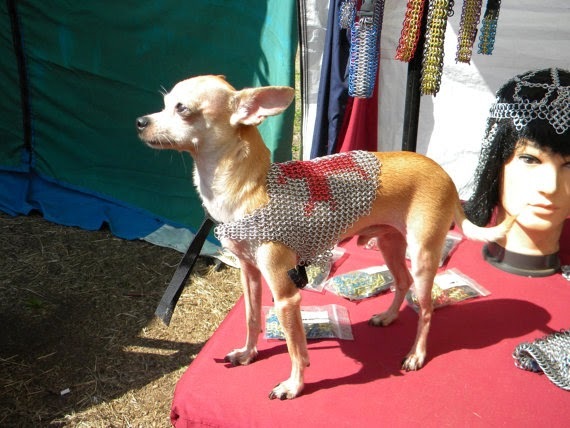 Chihuahua in chain mail. From the Modern Armour Etsy site. Think the armor is too much for a dog? Jenkins' armor is relatively light. The scale mail only weighs about 6.5 lbs. The armor "sheds heat," so Kodiak is able to wear it, even under Florida's hot sun. 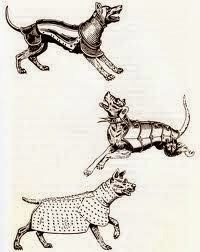 16th century war dogs from The Encyclopedia of Dogs. Dogs have been fighting wars since ancient times. And it was not unheard of that dogs of all sizes would run into battle with their owners in armor or at least spiked collars. They would perform tasks from carrying messages to taking dog war horses. Dogs are still fighting wars with us. Only now they wear kevlar. Wow, I have only seen armor on pictures of war dogs from several centuries ago, so seeing it on live dogs today is pretty cool!! Thanks for sharing this! There was another dog there wearing leather armor. I didn't ask where they got it. None of the other dogs were dressed up, sadly. Not a doggy corset or cog piece among them! Very cool costumes for the Renaissance Festival! That might be something fun to get involved with.